She is also a wanna-be photographer. An avid traveler, Lori has visited all 50 U.S. states as well as 55+ other countries. Her next trip will be in 2016 when she visits Hong Kong, Singapore, Vietnam, Bali, Bangkok, Australia, and New Zealand. Lori A. Moore has written a wonderful book to use with children when they have a pet die. 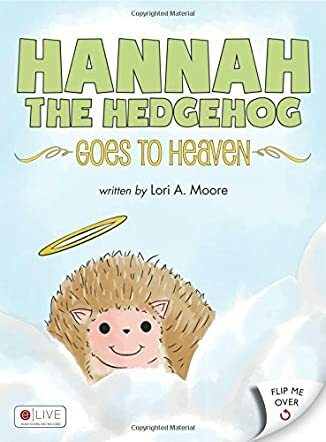 "Hannah the Hedgehog Goes to Heaven" is Lily's account of when her pet Hannah dies and goes to heaven. Lily shares what she notices about Hannah when she becomes sick and also her feelings during this time. The book can be flipped over and the story is titled, "Lily Loses Her Best Friend" and this time the story is told from Hannah's perspective. Hannah shares how she feels being Lily's pet and that she can see Lily dealing with being sad over the loss of her pet. This book is a great story to read to young children when they lose a pet as it is filled with details and emotions. It would be an excellent resource to use to help a child discuss his or her feelings with regard to losing a pet and understanding the loss. The illustrations are well done throughout the book and the story is so short that a child's attention will be held. This book goes that extra step by being two stories in one as the same story is told from two perspectives - the child's and the pet's. I highly recommend this book for each family's personal library and also to elementary school counselors as death of a pet can be quite common, but it also can be a difficult subject to explain and deal with. My grandaughter likes this book. One of her favorites.